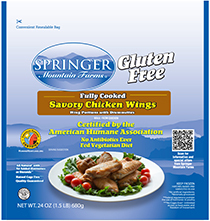 Springer Mountain Farms Fully Cooked, Gluten Free, Savory Wings are fully cooked for your convenience. Just heat and enjoy! 1. Heat oven to 450°F with rack in center of oven. 3. Place frozen chicken wings on baking sheet; arrange pieces 1 inch apart in a single layer. 4. Bake 30 minutes, turning once halfway through. Heat until internal temperature reaches 165°F. 5. Let stand for 1 minute.